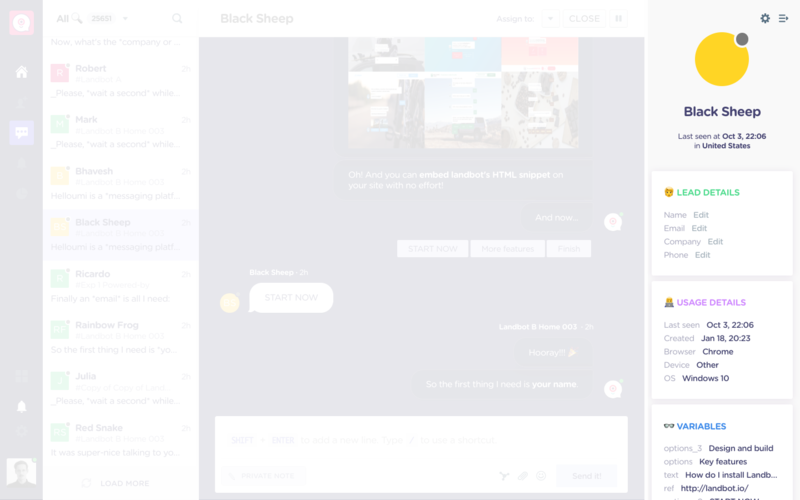 Welcome to the new Chat section: the place where humans and chatbots meet, redesigned. 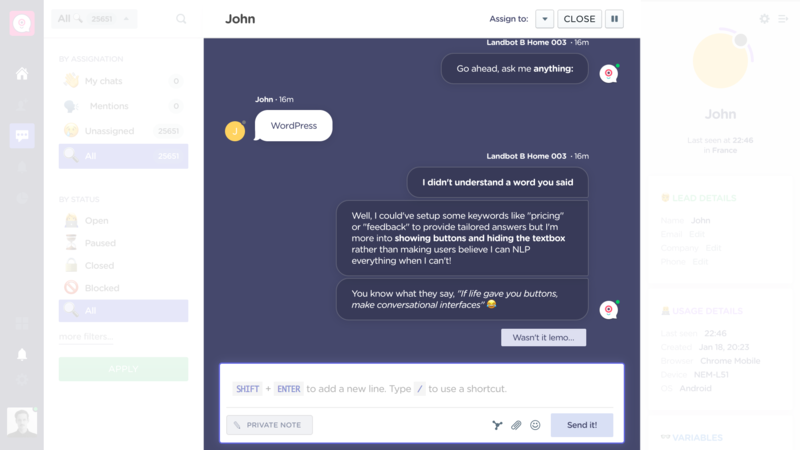 Welcome to the your living room: the section where you can see landbot's conversations in real time, jump into when needed, and launch landbot again you automate the tasks you add less value into. Go back to the Dashboard by clicking on the Home icon. Check the notifications by clicking on the Bell icon. Manage your status and log by cliking on your avatar. My chats. The conversations that are assigned to you, right now. Mentions. Find the comments other teammates left for you within conversations. Unassigned. Check the conversations Landbot is taking care of. All. Display all the conversations. Open. The conversations that are taking place right now, or still pending. Paused. All the snoozed chats by you and your teammates for later. Closed. Check the finished conversations here. Blocked. Annoying customers you'll never hear from again. All. View the chats from every status. By assignation. Check whose conversations you want to display in the section. By channel. 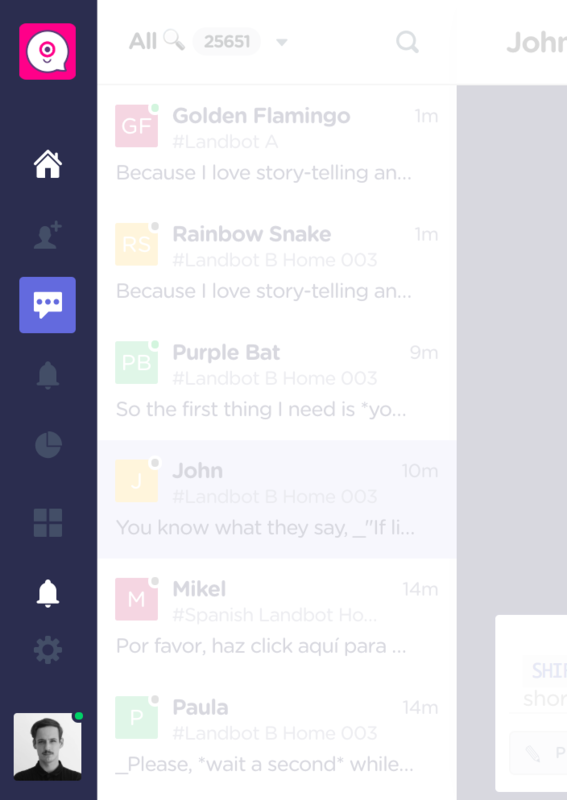 Pick a specific landbot and check its chats. By status. 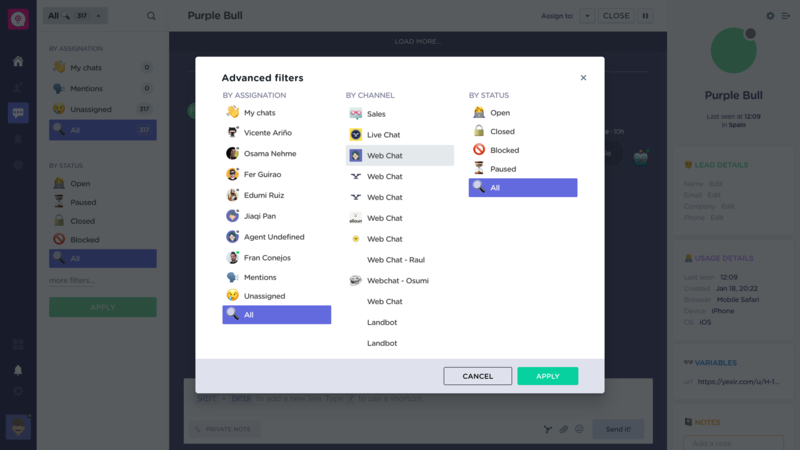 As we explained above, filter the chats depending on its status. And click on Apply to execute the filter! Assign the chat to someone to take care of it. Close it when the conversation is over. Snooze it until you're available or have a response. 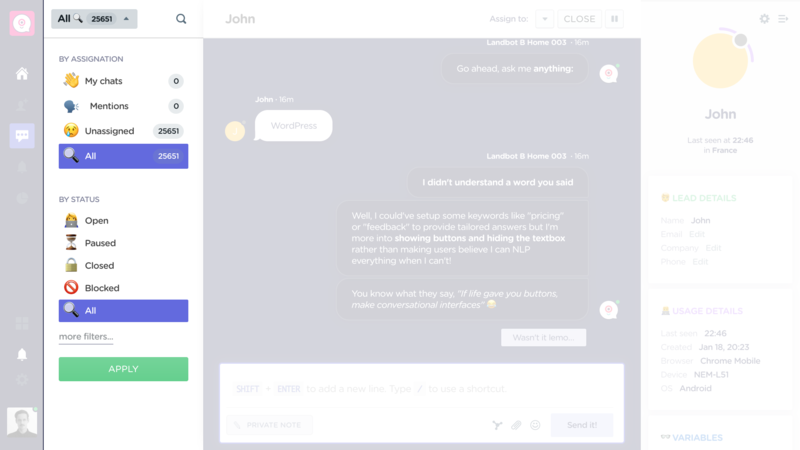 Enter text, video, emojis, notes and launch chatbots, all from the same place! Launch a chatbot by clicking on the new magic icon! 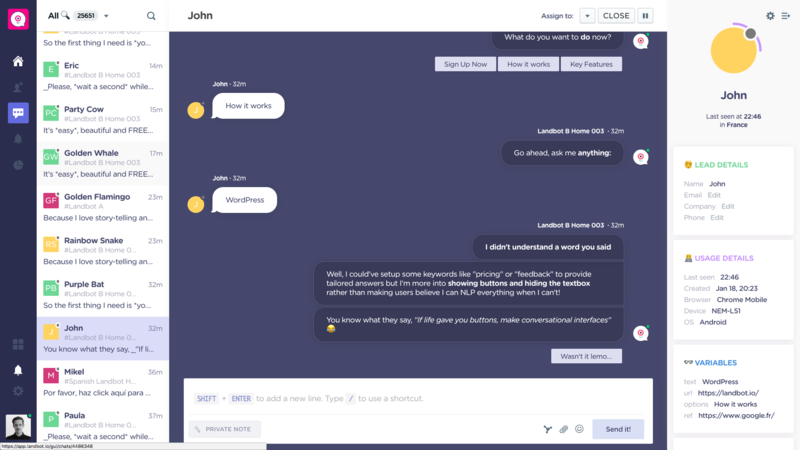 Then you can choose between any of the bots in your account and bring it to the chat to continue the conversation! Get leads, collect information or ask for feedback on autopilot, while you manage the rest of the conversations. User overview. Includes the user's name, the last time he/she was around the conversation and the country. Lead details. Name, email, phone and company fields that are automatically filled by landbot to help you qualify and follow up. Usage details. Usage data like browser information, OS or first contact. Variables. Custom fields that the landbot that's talking to this user collects and the values of the ones captured. And that's pretty much it! 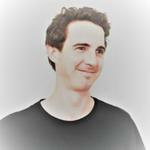 Start team-playing with your landbots to empower your customer communication!